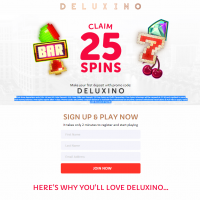 Deluxino is a stylish new casino ready to give you up to 25 wager free spins as a welcome offer. They have called themselves “the high-end gaming site catering to all of your spinning needs and more”. Who doesn’t love a high-end site, right? So let’s see how they fare in our review! Up to 25 Wager Free Spins! 350+ games from the likes of EyeCon and NetEnt. Deluxino is managed by Cassava Enterprises Limited (subsidiary of 888 Holdings plc.) and licensed by the UK Gambling Commission and Government of Gibraltar. From the get-go, I can see why the folks at Deluxino call the site high-end. Your eyes are immediately drawn to the white and gold design, with a geometric pattern on either side of the page (it’s a very fashionable wallpaper design don’t you know!). It’s like something out of a posh London flat and I love it! The first thing you see is the awesome welcome offer and a sign-up section but scrolling down, you get to the bread and butter – the games. 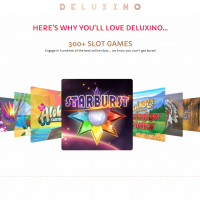 There’s also a section on Deluxino Rewards, their quality service and their mission statement. Unfortunately, there’s no way of testing any of the games for free. In fact, you can’t navigate anywhere besides the small links at the bottom. So you’ll have to sign up or log in to get “into the mainframe” so to speak. But from the pages I did see, everything was smooth – no lag or data-heavy images to load. High-end indeed! 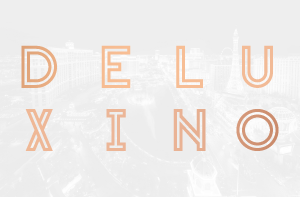 Deluxino offers the best payment methods such as Visa, Mastercard, PayPal, PaySafeCard, Neteller, and Entropay. The minimum deposit amount is only £5. There isn’t a maximum withdrawal amount although you can only withdraw money 10 times a day. Depending on your VIP Level, you can deposit anything from £500 to unlimited. We didn’t need to test the games to tell you how good they are. 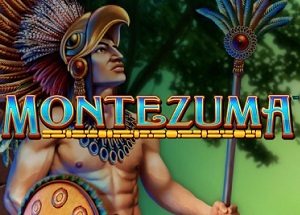 There are over 350 of them, including 300+ slot games to choose from. Not a barnstorming number but it’s quality over quantity with the Deluxino lot. Their collection features the likes of Rainbow Riches, Bonanza, Cleopatra, Starburst, and Shaman’s Dream. And there’s an array of live dealer games and table games – blackjack, roulette, baccarat – the usual stuff. 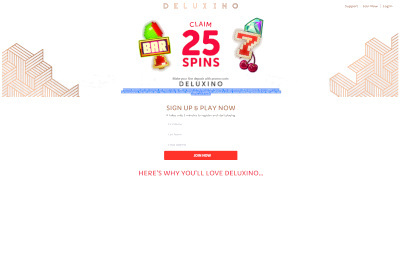 And let’s not forget the Deluxino Reward scheme. 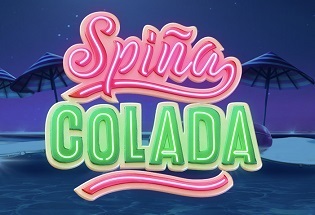 The casino offers up to 50 daily free spins, up to 10% cashback (daily and monthly), and special VIP rewards where you can win “suitably exclusive treats”. All you have to do is deposit £5 and wager a minimum of £1 on any game. How easy is that? I have to say, I love Deluxino’s site. It looks gorgeous and it runs like a dream. The game selection, while not extensive, has all the most popular games around so you won’t get bored. The fact their welcome offer involves wager free spins is a great way to stand out amongst the crowd. Gotta love no wagering casinos! You should also take note of that reward scheme with even more free spins, cashback, and VIP offers. You’ll be literally spoilt for choice. 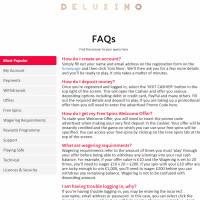 Deluxino also care for your safety, endorsing safe payments, a secure site, and a great freephone/email support system. It’s not 24/7 but maybe that’s an incentive to get some shut-eye after 2am when they shut!